Each year, OASC recognizes outstanding advisors who embody the ideals of our organization with the Warren E. Shull middle and high school Advisors of the Year. Warren E. Shull founded the National Association of Student Councils more than three-quarters of a century ago when he was a student council officer at his high school in Oklahoma. Mr. Shull passed away in 1987, but his legacy lives on through the award named in his honor. To be a goal-setting and planning tool for advisors and student leaders as they plan out their year. This program can help you achieve a balanced year of activities. To be used as an evaluative tool throughout the year – to help you see what you’ve accomplished, and stay focused on what you are striving for. A method whereby OASC can effectively recognize quality councils within the state. 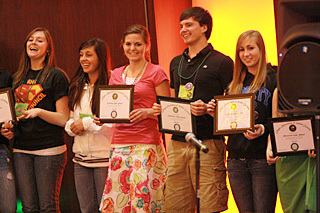 Award certificates are presented at the annual OASC Spring Conference at the end of April.